HIV is a retrovirus, which means it carries single-stranded RNA is its genetic material rather than the double-stranded DNA human cells carry. Retroviruses also have the enzyme reverse transcriptase, which allow it to copy RNA into DNA and use that DNA "copy" to infect human, or host, cells. When HIV infects a cell, it first attaches to and fuses with the host cell. 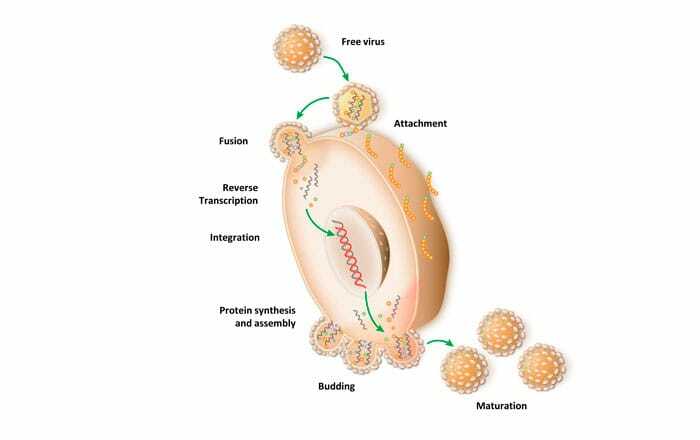 Then the viral RNA is converted into DNA and the virus uses the host cell’s machinery to replicate itself during a process called reverse transcription. The new copies of HIV then leave the host cell and move on to infect other cells.